For those of you, who just saw the Hong Kong police throwing tear gas at students, a quick summary what happened over the last months and years. Hong Kong was given back to Mainland China in 1997 under the “one country two systems” agreement. That means despite Hong Kong being part of China, it still enjoys a high degree of autonomy such as it’s own legal system, own currency, immigration rules (Mainland Chinese need a visa to enter Hong Kong) and more. Part of the agreement was that the people of Hong Kong will eventually be allowed to vote for the guy in charge here. They call it “Chief Executive” but it’s actually just more like a mayor of a big city or Governor of a State. This vote should be democratic, i.e. one person one vote. So far, the Chief Executive was “elected” by a committee of 1,200 or so guys taken from various constituencies. The whole system is messed up completely, thereby guaranteeing that only a person who is supported by Beijing gets the job. Anyone with just a rough understanding how a one party state such as China thinks and acts shouldn’t be surprised that the thought of having a democracy is anathema to the rulers in Beijing. So how does one reconcile having a democracy but still being fully in charge of who the guy will be? A few weeks ago Beijing granted that Hong Kong’s population can indeed vote for their Chief Executive in 2017. But there’s a catch. Beijing decides who can be elected. To be fair, there has been no information of how Beijing will decide who can run for the top post. Still, granting elections to the population but limiting the choices defies the term “democracy”. The result was predictable. With a history of street protests, Hong Kong’s population took to the streets. Hong Kong students started boycotting classes. Then Occupy Central, an initiative that planned to occupy the financial district, changed their plans. Instead of starting the occupation on October 1 (China’s National Holiday), they saw the thousands of students on the street and decided to get started immediately. Central was pretty much locked down yesterday with Police and protestors clashing. And then someone up in the high ranks of the Hong Kong government gave the stupid order to clear the streets. Why you should clear the streets on a Sunday evening, I don’t know. Anyone who has dealt with situations like this knows that this is similar to putting oil to the fire. Now we’re at day two and I hope China’s army will stay inside their barracks…. If you want to keep yourself informed about what’s happening in Hong Kong, the South China Morning Post keeps updated information on its website. If you can read Chinese, read “Apple Daily”. Hi Basti, somehow the News from Hong Kong does not work today in Beijing. But luckily the Mainland Media jumped in. We are happy that yesterday night thousands of people in Hong Kong gathered in the streets to celebrate the upcoming National Day. Wonderful. Basically China is going against the agreement by limiting the choice and choosing the candiates who can be elected. “The Chief Executive of the Hong Kong Special Administrative Region shall be selected by election or through consultations held locally and be appointed by the Central People’s Government. Clearly, the PRC’s envisioned end goal of the democratic reform line is universal suffrage to vote for candidates put forth by a nominating committee, not universal suffrage in the nomination as well as election process, which is the Occupy Hong Kong movement’s demand. “upon nomination by a broadly representative nominating committee in accordance with democratic procedures”. If you really think the current nomination committee fulfils the requirement of being “democratic” we can just stop discussing here. It simply isn’t. It really looks bad. Rings memories of Tianamen Square although this may be exaggerated. I just hope it doesn’t turn into a Kent State. 1.5 million Hong Kong people signed a petition asking that the Occupy Central not proceed and yet Hong Kong remains at a stand still, schools are closed , jobs and $billions of trade and commerce is being lost. Enter good ole Uncle Sam dressed up as the NDI. National Democratic Institute “The Centre for Comparative and Public Law (CCPL) at the University of Hong Kong, with support from NDI, is working to amplify citizens” A direct quote from their website. They are happy to brag about this intrusion in China. Made possible through support provided by the Office of Democracy and Governance, Bureau for Democracy, Conflict and Humanitarian Assistance, U.S. Agency for International Development complete with just a dob of misinformation. “After ”decades” of advocacy for electoral reform by Hong Kong activists and pro-democracy politicians.” Hong Kong has been with China for only 19 years and yet no mention of the British rule on their page. 1. Madeleine Albright, the first woman to represent the U.S. in regards to foreign affairs as the secretary of state and NDI chairman. 2. Tamara Cofman Wittes who served as deputy assistant secretary of state for Near Eastern affairs from November 2009 to January 2012, where she coordinated U.S. policy on democracy and human rights in the Middle East. 3. Ambassador Karl Inderfurth, assistant secretary of state for South Asian affairs from 1997-2001, and was responsible for India, Pakistan, Afghanistan, Nepal, Bhutan, Bangladesh, Sri Lanka and the Maldives. 4. Former U.S. Senator Edward “Ted” Kaufman of Delaware who served on the Foreign Relations, Armed Services, Judiciary and Homeland Security committees. With a very advanced technology department, make no mistake, this is as good as George Orwell’s 1984 “Thought Police” as you are going to get. It may be set up as an independent body but with such high profile and political members it should be concluded that it operates as a wing of the US Government. The Hong Kong students involved have been wound up by direct intervention of the NDI who has also been involved in such working democracies as the Ukraine, Afghanistan, Pakistan, Iraq, Libya and others. Pfffft! The Hong Kong students have then been set loose on the streets of Hong Kong and to prove the strength of their fervor are making ridicules conditions to any negotiations such as Mr. Leung, the Chief Executive, standing down. They are sheep doing their bit to destabilize Hong Kong and China for the USA, under the disguise of bringing so called “True Democracy” to Hong Kong. Whatever that is supposed to be! There is an old saying. “If it’s not broke don’t fix it.” I’m wondering, after watching the US stumble from disaster to disaster for 55 years, when they are going to learn this lesson and get their noses out of everyone’s business. I’d really appreciate if someone could translate this to Chinese for me please! That “jobs and billions of trade and commerce is lost” is simply not true. Granted, some shops in the affected areas saw their sales decrease. But the rest of Hong Kong is going on as usual. Why should a bunch of students sitting on the street affect Hong Kong’s economy? That’s nonsense. And please stop spreading those anti-American conspiracy theories. Not everything that’s happening in the U.S. is due to the U.S. (a lot of is, but not this). The people of Hong Kong simply want to elect their CE (who to be honest is just like a mayor of a big city) of their choice. There’s really nothing wrong with that. The link I have supplied is a direct link to the NDI website and all information regarding the NDI I gathered from there. Not enough information for you then check this out from the Hong Kong University. This event was the fourth in the CCPL/NDI Hong Kong Political Reform Series – a partnership which began in 2009. The Hong Kong Political Reform Series is a conference series which seeks to promote dialogue among different sectors of the Hong Kong polity. Research Assistant Ada Lee works with CCPL and partners NDI on the Design Democracy project. Hong Kong. The project is currently staffed by a full-time Research Assistant, two part-time Student Research Assistants and a summer intern. I really don’t have a problem if the U.S. funds democratic developments. Everything that allows Hong Kong people to elect their leaders in a fair and open election should be welcomed. Come on Basti open your mind I am not a communist but a 55 year old man who is disillusioned with western media and governments. I was raised thinking we were the good guys. I’ve just giving devastating evidence that the US is fully involved in these protests. These types of intrusions I was taught were the act of Beijing and Moscow! I then look back and think about Vietnam to The Ukraine and all of a sudden it is clear;. We are the bad guys! The U.S. has definitely NOT been involved in these protests. Come on, students sitting peacefully on the road, cleaning the road every morning and recycling their rubbish? That doesn’t sound like the western world. If they had smashed shops, burned down cars you might have a point. But this… No, that’s Hong Kong’s new generation. I studied in Hong Kong many years ago and wasn’t too impressed with the students here. They didn’t care about anything really. How things have changed now…. In most Commonwealth countries the Queen or her unelected Governor General is the head of state. The prime Minister appoints the GG. That unelected GG can dissolve the government and call fresh elections. When you vote you don’t choose the Prime Minister either, you vote for the person in your local electorate and then he gets together with like minded people and they choose the Prime Minister. Sure at the time of the election you may be aware of whom that is but in Australia an “elected” Prime Minister was thrown out twice in six years. In 1972 the GG dissolved parliament and called fresh elections when Gough Whitlam was disposed. This is true for any Nation which has the Westminster system of government. In my eyes the system offered by Beijing is superior to what is generally accepted as a strong form of democracy. Beijing is offering a vote from candidates and so Hong Kong gets to choose their leader! Surely an elected official is better than an appointed one or a Monarch who is there only for her family’s history? You’re citing the Westminster system. There’s still France, Germany, Italy, Denmark, Sweden, Norway, Spain and many, many different forms of how to have a democracy. Granted, the UK system is actually a “elected dictatorship” as the UK doesn’t have a written constitution. As to your monarch: fire her. Become a republic! “In your eyes” it might be better. But I reckon you own a passport (of a country that guarantees free speech) and can always leave here if it doesn’t suit you. If China’s system is superior, I wonder why all my friends in China want a) an apartment b) a car and c) a foreign passport (preferably U.S. or Australian). i thought it was the dream of most people to want an apartment and car. As for the foreign passport try making some friends that don’t speak English because I believe those that want a foreign passport are the minority. Not to mention the amount of Chinese who get the foreign passport and then 10 years later are back because they learned that the land of milk and honey was a myth! Ok then let’s look at the US republican system where a group of some thousands elect two members from the ruling elite to run against each other. That is soooooo much better. NOT! Enough of the rhetoric, please basti, this is just for a mayoral position! Not to run a country but the city mayor and all of this hoopla is nothing more than US S#^t stirring as I have demonstrated. Those friends I cited don’t necessarily speak English. Reading through your comments I feel you’re just acquainted with the Westminster and U.S. system. That’s too bad and somewhat limits the discussion. As you mentioned – this election is just for a mayoral position. Why not let them vote for their mayor. I can’t see any harm in that. Maybe a mayor elected by universal suffrage can achieve what the pro-business puppets haven’t achieved over the last decades: affordable housing, cleaner air, solve the rubbish problem and tell Hong Kongers that they are part of China. Your argument that the US are not involved, despite the paper trail I have offered as proof that the US are involved, is that the protesters are clean? Let’s assume the U.S. is involved in financing pro-democracy groups and think tanks in Hong Kong. So what? This is not Vietnam. It also isn’t about Hong Kong’s history as a British colony. Those students on the street are too young to remember any of that. 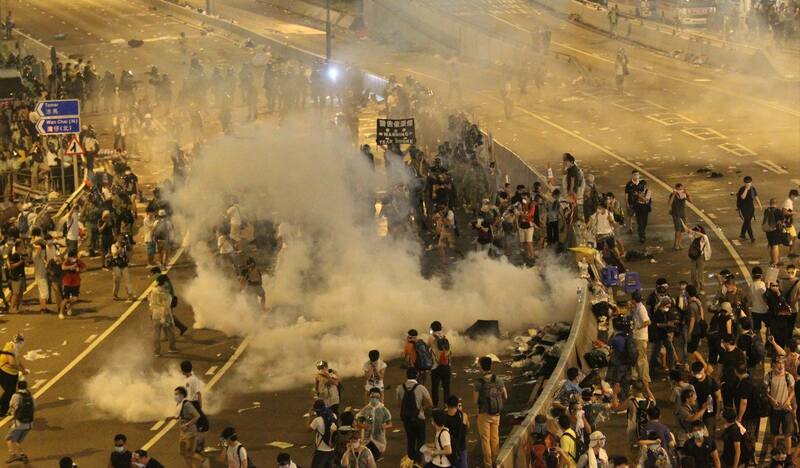 Most people in Hong Kong are aware that China isn’t Hong Kong’s enemy. China is Hong Kong’s future. But that doesn’t mean they shouldn’t be allowed voting for their CE. They will be able to vote. That’s the whole point, finally after 100 years of British rule and nothing in the way of a democratic election. China are now offering a choice and as I have shown a choice not much different than that which we have in so called free democracies! The rest is all destabilizing BS, as I have also shown, stirred up by the US. It’s not about Britain. Get over it. I know it’s hard as a former power, but it’s not about you. Yes, they are able to vote on pre-screened candidates. It’s sort of like saying: choose whatever restaurant you want, as long as it’s McDonalds or Burger King. I guess, it is more a disappointment then actually a broken promise. Too big hopes, tja. ZSRenn, do you have a comment on the “Dotted Line” in the South China Sea? Ha, so much discussion going on here…. Maybe I should write another piece…. That’s another topic. Please feel free to start the discussion send me an invite and I will gladly join it! Fair enough. Unfortunately, I don’t have a website for such debates. Would be interested in your statement though. Sounds like you have a comprehensive knowledge of views which I can test my own opinion against. Why did you have to do that? I thought we having an adult discussion and then when you find you are losing that discussion you choose to play the man and not the ball! I guess they were lucky they weren’t on Wall Street when 700 were arrested!
? … now you lost me. Never mind. Thanks for your comments. That wasn’t at you Marcus. the forum structure is abit confusing. I don’t think I’m loosing the discussion. But I think you’re too much focused on Uncle Sam. This is a Hong Kong issue, leave the Americans out. The question is: should Hong Kong’s population vote their CE in a free and open election? I don’t see why they shouldn’t. 1.5 million signed a petition asking that Occupy Central doesn’t proceed. The total population is almost 7 million. Hi Basti, … nice. Seems quite heated. Sorry, did not want to poor oil into the fire. Hope all is fine and best greetings from the Great Nation. Some reading before you do to make it a fair debate. The San Francisco Agreement and the Cairo treaty. So that’s the basis for them claiming pretty much anything down to Malaysia? all fine here. How are your travel plans going?